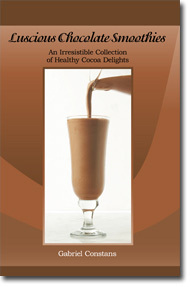 Enjoy this lively recipe from my book of chocolate smoothies. 1. Place all ingredients, except brandy, in a blender and mix on high for about 2 minutes; add brandy and blend for 10 seconds more. 2. Pour into tumblers or wide-mouthed glasses and drink with the goddess..